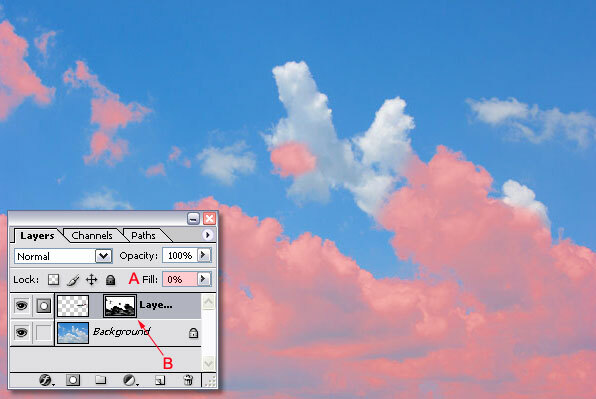 This Photoshop tutorial explains how to place a plane in some clouds and how to create the illusion of depth. Later in this tutorial we're going to use this plane to create a short animation in ImageReady. Open the channels palette. Since we're working in RGB, we will see three channels; (R)ed , (G)reen and (B)lue. 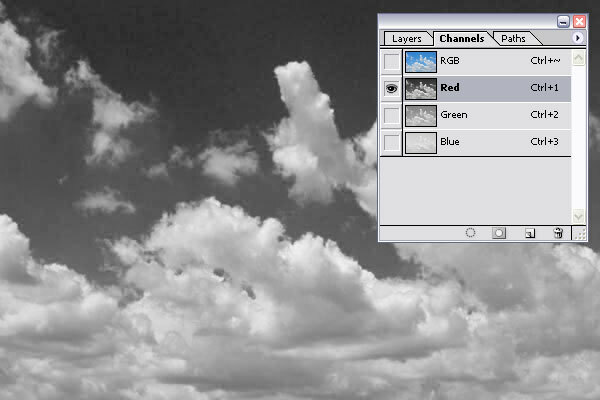 Notice when you click on the red channel that it has a lot of contrast between the sky and the clouds. This means that this channel is a great candidate to be used as a mask later on (you'll figure out soon what I mean). So with the red channel active (click on it once), go to the menu and choose Select / All (shortcut Ctrl + A or Command + A on the Mac). Continue by choosing in the menu Edit / Copy (shortcut Ctrl + C or Command + C on the Mac). This will place the content of our red channel on the clipboard. Needless to say that after you've done this you shouldn't copy anything else to this same clipboard or you will lose its content. Remove the selection that's still active by selecting in the menu Select / Deselect or use the shortcut Ctrl + D (Command + D on the Mac). We're going to add the image of an airplane, one that you can download here (right click on it and select Save Target/Link As...). Open this file that contains the airplane, select the Move tool in the tool bar, click on the image of the plane, hold down the mouse button, drag the image to our file with the clouds and release the mouse button. Click on the Add a layer mask icon in the layers palette to add a layer mask. This will open the layer mask in the document window, which will now be completely white. Continue by selecting in the menu Edit / Paste (shortcut Ctrl + V or Command + V on the Mac) to paste the content of the clipboard (the copy of the red channel) on our mask. Please remember this; the color black in a layer mask means ignore. Notice that by inverting the clouds we have made them black and since black means ignore, it means that in those areas parts of the plane won't show up and that's exactly what we want, because it creates the illusion as if the plane is behind the clouds. At the moment this mask is linked to the plane layer (notice the link icon between the mask and the plane layer), which means if one of them is moved, the other one will also move. Because we want to be able to position the plane without moving the mask we have to remove this link, so click once on the link icon to remove the link; the icon will disappear (A in next screenshot ). Go to the tool bar and select the Move tool (if it's not selected). You can now use the mouse to move the plane in any direction. Notice when you do this, that the attached mask will stay in the same position since we've removed the link icon. Important: always make sure that the layer with the plane is active (its thumbnail will have a double border in the layers palette) and not its mask. The mask should never be moved at any time. If you move the mask by accident, just press Ctrl + Z (Command + Z on the Mac) to undo the move. 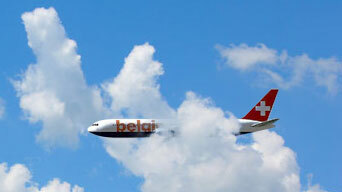 Also notice when you move the plane that it will always disappear behind those clouds that are close to pure white. 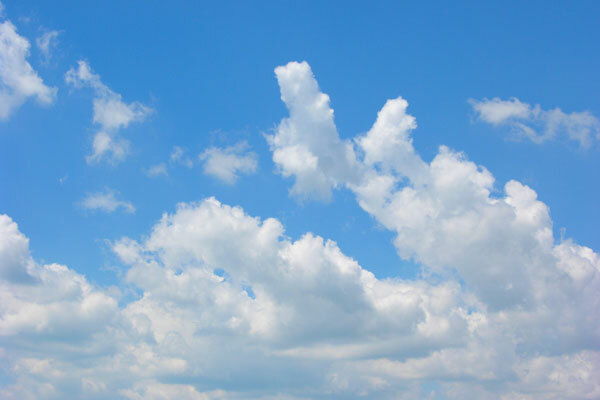 However to create the illusion of depth it would be nice to have the plane sometimes appear in front of these bright white clouds (from the viewer's perspective). My tutorial shows you how to do this in a pretty simple way. Select the brush tool in the tool bar. Open the brush picker window in the option bar by clicking on the button with the little triangle marked with A. Select a round brush, select a Master Diameter(B) of 20, a Hardness (C) of 0% and an Opacity (D) of 100%. Click on the mask in the layers palette to make it active (it will now have a double border (B in next screenshot )). Continue by pressing the \ key on your keyboard, which will change the mask into the equivalent of quick mask mode (the clouds are now a light red). Note: Instead of using the \ key, you can also hold down the Alt+Shift keys (Option+Shift on the Mac) and click on the mask in the layers palette instead. Change the foreground color to black by pressing the letter D on your keyboard. When you're done, press the \ key on your keyboard to leave the quick mask mode. You can now grab the move tool and move your plane around to see how your adjusted mask has corrected the depth in your image. Save your current file by selecting in the menu File / Save and name it clouds.